When there’s mention of ribs, I usually think pork and beef ribs and would normally only eat lamb ribs at a restaurant, and never buy them myself. Though on a recent visit to the butchers the lamb ribs diverted my eyes away from the usual go-to, and I’m happy they did. With this being a fatty cut of meat, you have to be sure not to saturate them or add too much oil in the marinade and ensure you roast them on a rack so the fat can crisp up as they slowly roast. 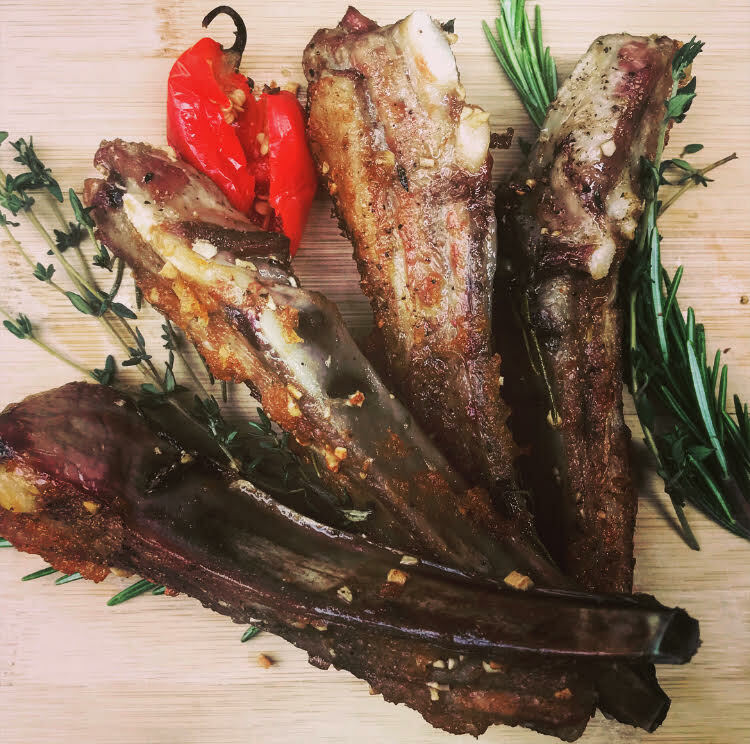 Another great recipe to try out this summer and we all know the only (and best) way to eat ribs is with your hands, so great for garden parties – enjoy! Pre-heat the oven to 130⁰C. Line a roasting tin with greaseproof paper and put a roasting rack on top of it. In a bowl, mix together all the ingredients listed above except the CHAM CHAM Hot Pepper Sauce. Add the lamb ribs to the marinade and mix together. Then pull the thyme and rosemary from the marinade mix and place on the roasting rack first and then the coated ribs on top of them. Put the lamb into the oven for 1 hour and after that hour, remove the ribs from the oven, turn the oven up to 175⁰C and while the temperature rises, brush each rib on all sides with CHAM CHAM Hot Pepper Sauce. Place the ribs back in the oven for a further 15 minutes and they should now be super crispy, juicy and tender and ready to serve!